Go Bulldogs and Lion Fish Team! I want to thank my niece, Caroline, and Mrs. Blackwell’s Seventh Grade English Class at Broad Creek Middle School in Newport, NC for hosting me today. What a great bunch of kids! I loved hearing about the school play that they are working on, Willy Wonka Jr. It starts tonight and goes until Saturday. If you’re in the area, I encourage you to go see it! Break a leg everyone! Can you give a quick summary of From Blue Ground? Sure. The story is set in 1876 in the coal hills of Pennsylvania. It follows brother and sister, Patrick and Sissy Hughes, who are on the run after witnessing the murder of their father. They carry with them a wooden box retrieved from a secret compartment beneath their father’s bed. His dying words to them: “keep it safe, keep it hidden.” Powerful men are looking for what’s inside the box and they will do anything they can to get it. Alone and on the run, they are pursued by their father’s murderer, James McKenna, a Pinkerton Security Agent who is working undercover investigating the Molly Maguires for the Philadelphia and Reading Railroad. Patrick and Sissy’s only hope is to unlock the mystery of the box: a diary, a translucent blue stone and a bag of blue ground. That hope lies in Philadelphia with Henry Carvill Lewis, a professor of mineralogy at the Academy of Natural Sciences. As they make their way to Philadelphia, their pursuers grow in numbers and Patrick and Sissy must fight against time and the odds to stay together. There are two books I’m working on in various stages. The first is Summer Changes Everything, which is about three-quarters of the way finished. It’s realistic fiction, not historical fiction, and takes place in present day Pennsylvania. It tells the story of a troubled young skater named Dylan who gets sent to his grandparents house for the summer. He hates it at first, but it turns out to be a life-changing experience for him. I also just finished the plot treatment for the sequel to From Blue Ground, which is tentatively called From Prussian Blue—it takes place about 20 years after From Blue Ground. I’ve always wanted to write and tried several times to write a novel, but was never able to finish. Then I took a class on middle grade novels for a Master’s degree I was working on and we had to read about 15 novels over the course of about three weeks. I read a lot of Newbery Award winning books and some of them I really loved, some of them I didn’t. While I was reading the not so good ones, I kept saying to myself, “I could write something better than this.” Now these were all Newbery Award winning books, and I realized that that was a pretty arrogant thing to be saying. So, I thought I should put up or shut up, so to speak, and I started to write. The books that I really liked were Bud, Not Buddy, Hatchet, Pictures of Hollis Woods, Gone, Holes, and Hoot. But the one that really inspired me was Fever 1793 by Laurie Halse Anderson. Now, if you’re familiar with that book you know that it’s Historical Fiction and it takes place in Philadelphia, just like my book. So, I took inspiration from there. How did you chose the setting? I had done a lot of research for my first Master’s Thesis, which is in Music History, on 19th Century Philadelphia. It was then that I came across the Centennial Exhibition of 1876 and I thought that it was just amazing. It was really America’s first World’s Fair and the buildings they built just for the fair were unbelievable. I thought that that would be a really neat time period to write about because of the things that happened during that time like the rise of the railroads, the Molly Maguires, Pinkerton Agents. I just thought it was a great backdrop for the story. It probably took me about four years of working on it off and on and several more years to get it published. When it was finished, I basically sent the manuscript out to all the publishers I could find in Pennsylvania who would publish Young Adult Historical Fiction. I was turned down several times and then Sunbury Press, my publisher, agreed. I’m really happy to be working with them. They are a really outstanding publisher who are innovative in their approach to the publishing business. I was really lucky because most authors—even the really famous ones—get turned down hundreds of times before they get published. Did it cost you anything to get it published? Not really. The only thing it cost me was about $700 I spent on a lawyer for a consultation to look over the contract, and I really didn’t have to because, as I learned later, it was a pretty standard contract. Everything was done in house at the publisher—the cover, the editing, the typesetting, everything. Well my favorite book of all time is Harper Lee’s To Kill a Mockingbird and of course I like all of Shakespeare’s plays. I also get a lot of inspiration from music. Of course, I also like J.R.R. Tolkien, Cormac McCarthy, and John Grisham. As far as Young Adult authors I like Laurie Halse Anderson, who wrote Fever 1793, J.K. Rowling, and Rick Riordan. But when I sit down to read for fun, I read Stephen King. He’s a really good writer and he knows how to tell a really good story—and that’s what writing is all about, telling a good yarn. I can rip through a couple of good Stephen King novels sitting on the beach in Emerald Isle in about a week—just really get lost in the book. That’s what I really love to do. Do you have any regrets about the book or things you wish that you had done differently? I consider myself more of a storyteller than a writer. So, I’m always looking back over my writing and saying, gosh I can make that better—even in From Blue Ground. So that’s a lesson for today as far as writing goes—you’re never done, even when you think you’re done, you can always make it better. But as far as From Blue Ground goes, I’m happy with it the way it turned out. At some point, as an artist, there comes a time when you just have to say that you’ve done all you can with it and let other people enjoy what it is. I did the best I could with it and that’s really all you can do in life is your best. If you do that you’ll have no regrets. So no, no regrets, nothing I would have done differently. That’s what sequels are for. How many books do you think you will write? I have at least four more good stories in me right now. I don’t know how many more will come to me, probably more, but right now I have about four planned out. Right now I’m working on a short story that my publisher asked me to write. Sunbury Press is putting together a compilation of stories on Climate Change for the “Cli-Fi” genre. The story I’m working on is called Twilight of the Gods. It takes place about 100 years into the future when the world is really dealing with the effects of climate change. What made you decide to be an author. Well, at first I wanted to be a musician. Artistically, my first love was music. and music is still a big part of my life. But, I need an artistic outlet and as I got older I turned more from music to writing because it’s something that I can do by myself, rather than playing music with a bunch of other people and I can do it anywhere. I’m sure there are some kids in your class who are artistic. Some kids are good at sports, some are good at music, some at art, some at math, some are skaters, some are even good at gaming. We can learn a lot about ourselves and our world if we follow our passion. Writing is what helps me make sense of the world. It helps me channel all the things I read about and learn about into creating something positive. 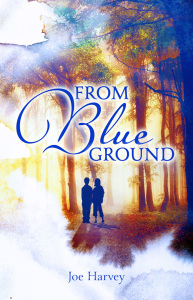 From Blue Ground is moving up on the Best Seller List on Sunbury Press! MECHANICSBURG, Pa. — Sunbury Press has released the bestsellers list for January, 2016. Dr. Arif Shaikh took the top spot with his compilation of 365 tips for personal growth Healing Tips for the Mind, Body, and Soul. John E. Wade II’s Bipolar Millionaire took the #2 spot.